A tool that will automatically store your different versions of Fallout4.exe files in backup folders. Now you will always have a backup of your executable in case you unintentionally updated your game via Steam. Requires F4SE. A tool that will automatically store your different versions of Fallout4.exe files in backup folders. Now you will always have a backup of your executable in case you unintentionally updated your game via Steam. 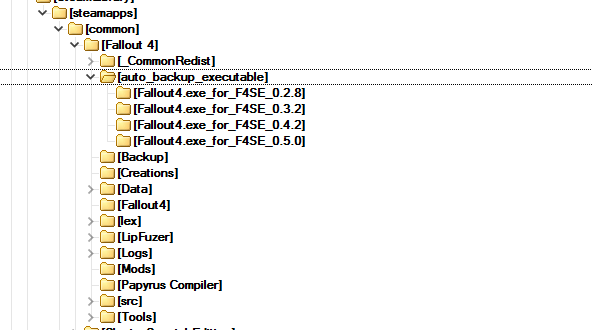 You will find your executables in a folder called "auto-backup-executable" under your Fallout 4 installation directory. Extract the contents of the rar file to your Fallout 4 Data folder and don't forget to run the game with F4SE (f4se_loader.exe). CHECK OUT THIS AMAZING TUTORIAL BY MICHAEL FROM GAMERPOETS!